You find me in a happy mood. I think this is partly because I am now actively seeking out happiness rather than just hoping it will turn up. Does that make sense? So here are some nice things in my world right now. On the night before my son’s 18th birthday there was tension between his parents as I had planned and my husband had assumed everything would be OK. So I had organised the present, card and wrapping. I had talked with my son to find out how he wanted to spend his day. I was miffed that my husband had not taken the day off work for such a big day. As regular readers will know, I love celebrations and my husband does not really see the point. Anyway we worked out that if we went out at teatime instead of lunchtime we could eat and then go to the bar together. Then at the weekend we could have a fancy lunch together. I have also told my son that like myself with my milestone birthday, treats will take place throughout the whole year. My son was happy on his 18th birthday. It was full of very simple pleasures such as pancakes for breakfast, time connecting with his friends, walking the dogs and then going out for the evening. We had amazing food in a café that has changed hands and then just a couple of drinks at the bar as he likes to go but not for hours on end. The Saturday lunch was wonderful and eventful in many ways one of which that his meal was late to be served so he got it for free. My husband and I who are both very flawed individuals (like the rest of the world!) somehow came together to acknowledge that we have managed between us to bring up an amazing young man who is kind, sensitive, caring, intelligent, modest and well-mannered. I start my day and end it well with my new Reflex Pillow which gives such a cuddle to the head. My lovely Collie/German Shepherd cross dog kisses me every morning and likes a cuddle. My grumpy old Beagle is an asset at this time of year as he is like my very own hot water bottle. I am taking time out to read and it is a joy to do so. It was very much one of the things that I lost along the way after becoming a parent. Also we have invested in a DVD player so we can have regular family film nights and have just picked up a job lot of bargain DVDS too. In all the madness of the weekend, I fell for a sales pitch and bought an half-price fancy coffee machine. It is so clever and compact and has all sorts of flavours of coffee with it too. I rarely invest in expensive kit for myself but this is all part of that milestone year I am determined to have. I have also got some new snuggly pyjamas. It’s all about the self-care baby! My daughter has her new glasses. She is listening to me more on the home education front but still more keen to her own thing and perhaps that is no bad thing. She is happy out of school and so self-motivated. Today she is researching Twenties fashion for a new character she is writing and designing. Maths work was done with just one careless mistake. 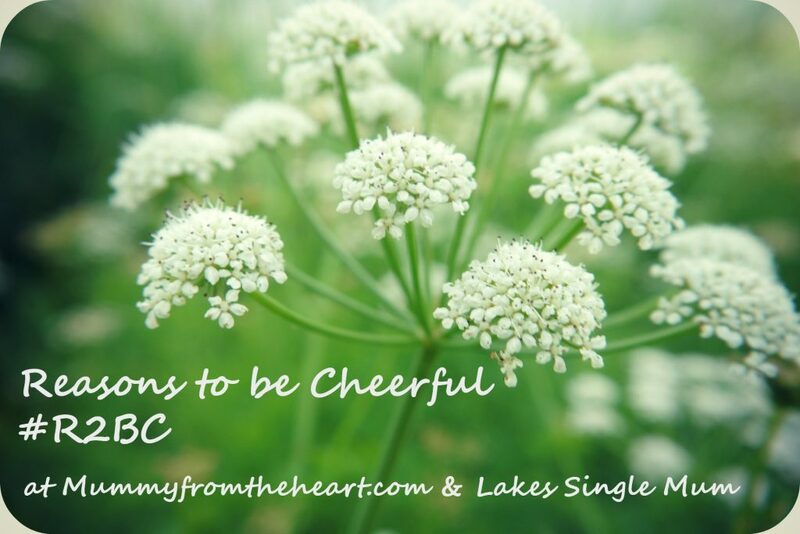 I just asked if she has any reasons to be cheerful and she said she has no reasons but she is cheerful. That will do me! My youngest son and I made a brilliant apple crumble as part of my other son’s birthday treats. We love cooking together and because we followed the recipe to the letter, the results were wonderful. I am having daily forest walks with my new man, 2 dogs and a cat. I feel so happy when I do this and there is much to learn from that. My brother’s widower sent a card for my son’s birthday and has offered him a holiday in Cornwall. It seems clear now that my son will head back to the UK in 2019 and he has application forms for volunteering opportunities as a first step to creating a new future for himself. I want him to make the most of family whilst he is over there deciding for himself what he thinks of them all. It turns out my brother’s widower’s nephew and neice work in some of the industries that my son wishes to pursue so that might be fortuitous. Life is not perfect just as I am not. I am learning rather late in the day that is OK. Happy birthday to your son. It sounds like he had a lovely day. The coffee machine sounds fab. We need to treat ourselves now and again. Wow! So many lovely highlights and new discoveries. Fab to hear that your son had a great birthday and has so many adventures to look forward to when he returns back to the UK. It sounds like your son had a good birthday. I have made it a goal of mine this year to take more time out to read, I am so glad that I did, I have read some fantastic books this year. It’s great to hear that you are feeling happier and looking at all of the positives! Thanks for sharing with #TriumphantTales.